12,310 others viewed this post. This is my second attempt at an iridium flare and it turned out great! Iridium communications is a company that launched a grid of satellite clusters that covers the entire planet to provide constant satellite-phone connectivity anywhere. 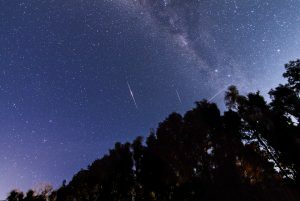 There are about 90 of them, but about 20 of them have died including one that smashed into a Russian satellite in 2009. What you are looking at is sunlight reflecting of the door-sized antennas, glinting directly back into my camera. These flares can be predicted fairly accurately so I knew these two flares would occur within 2 minutes of each other. The bright one on the left is Iridium 37 which is still operational, but the duller on on the right is Iridium 4 which went offline about 4 years ago and has since been replaced with another (they launched enough to have some redundancy built into the grid). I was lucky to get this because I only decided to run outside 10 minutes before it was due. The camera battery was flashing red and about to die, I had no time to focus or frame the shot. 3 minutes before it happened the ISS went though the frame as well but I didn’t add it to this shot as the exposure was wrong. I took the first shot and got the small flare, took the second shot and got the large flare – and then my camera screen flashed up “CARD FULL”! Talk about a close call. 2 x 30s / f2.8 / ISO 1600 / Canon 70D / Tokina 11mm / Nebulosity + Photoshop CC. 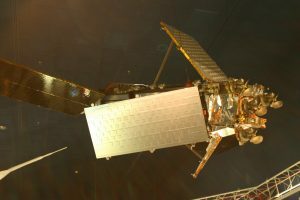 Pictured – An Iridium Satellite. For kicks.. here is the shot with the ISS going through it just before!